NATIONAL HARBOR, Md. – The Advanced Arresting Gear (AAG) test schedule for aircraft carrier Gerald R. Ford (CVN-78) was pushed back again, but the delay may cause little impact thanks to a slew of post-delivery test requirements for the first-in-class ship, the CVN-78 class program manager told USNI News. Manned aircraft just began arrested landings on a ground-based AAG runway system in New Jersey on March 31, Capt. Chris Meyer said Monday at the Navy League’s Sea-Air-Space Exposition 2016, and the first manned airplanes will not be cleared to land on Ford until November. Program officials last fall said the manned aircraft landings in New Jersey were set to begin in February, with the first ship landings cleared by this summer. 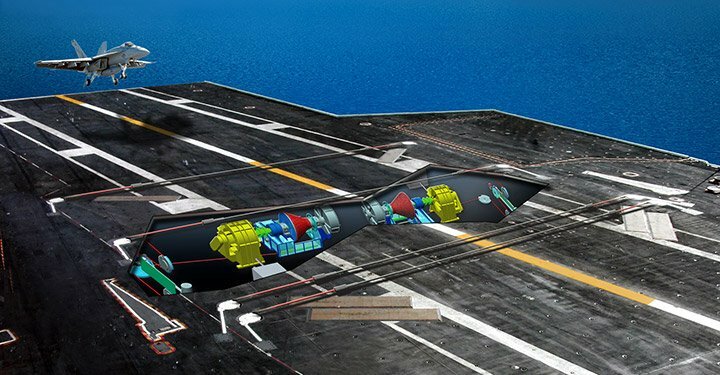 Due to a design problem in General Atomics-built AAG discovered three years ago, the system faced about a two-year delay and, whereas the rest of Ford is 98 percent complete, AAG is still being installed on the ship. The Navy intended to install the improved AAG on the ship and conduct land-based tests at Joint Base McGuire-Dix-Lakehurst, N.J., concurrently to help buy back lost time. Though the delays with AAG continue, Meyer said it was possible that the new pushed-back schedule would have no operational impact. On the hull side, Ford is set for builder’s trials and acceptance trials in August, where the ship’s propulsion, mechanical, electrical and combat systems will be tested but not flight deck operations. The carrier is set for a late-September delivery – compared to the previous March 2016 delivery date – pending the results of the sea trials, Meyer told USNI News after his presentation. Once the ship delivers to the Navy, six-month shakedown period will begin. “It’s important to remember that we’re not going to start on day 1 on the ship launching and recovering fleet aircraft,” he said of the ship shakedown. Because the island on the flight deck is shaped and located differently than is the island on Nimitz-class carriers, the Navy still needs to understand how that will shape the wind patterns for flight deck operations. The very first at-sea period for the ship after its delivery will support rotary wing dynamic interface testing, Meyer said. The carrier will then conduct air traffic control certifications with its new radar systems, and will eventually bring out test squadrons to conduct the first manned launches on the Electromagnetic Aircraft Launch System (EMALS) and manned arrested landings on the ship with AAG. 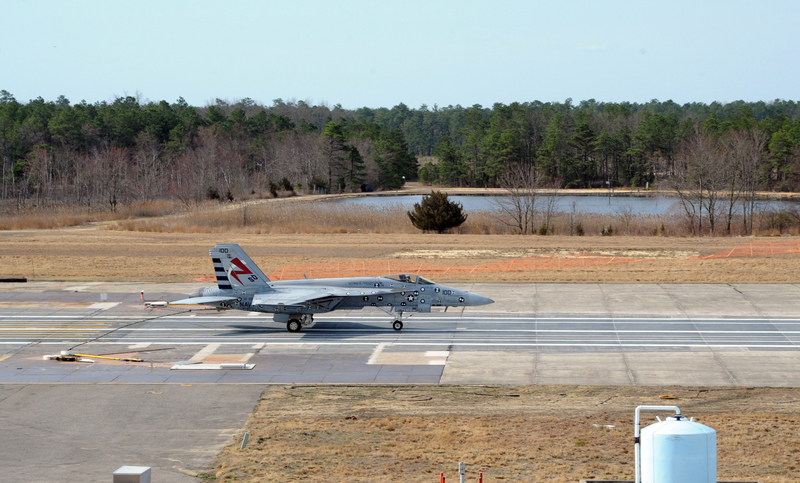 Meanwhile, manned AAG testing in New Jersey will continue, with the Navy testing F/A-18E-F Super Hornets first. By November the engineers will issue an Aircraft Recovery Bulletin for the Super Hornets, allowing them to begin landing on the aircraft carrier. “So by the time we’re ready to do fleet aircraft, all of this will have sorted itself out,” Meyer said, noting that a November start to Super Hornet flight deck operations will work fine given the rest of the post-delivery events. The engineers in New Jersey will then test the E-2D Advanced Hawkeye and eventually the legacy F/A-18C-D Hornets. “I’m pretty confident two of those are going to finish before shakedown is done,” Meyer told USNI News. Still, Meyer said he hoped to receive Aircraft Recovery Bulletins for the two remaining aircraft types before the end of shakedown so as not to affect crew training. “You want the ship to be able to train with the full air wing, so if that recovery bulletin is not done then that’s one plane in the air wing that you couldn’t train with on Day 1,” Meyer told USNI News. Once delivered, put through shakedown and a post-shakedown availability and then commissioned, the ship’s crew will have two years to train ahead of a summer 2019 full ship shock trial. Despite ongoing AAG challenges, Meyer said the rest of the ship was coming together nicely. The ship is 98 percent complete, with 88 percent of hull, mechanical and electrical (HM&E) testing complete and 78 percent of electronics testing complete. The remaining testing is “on track to finish up this summer” ahead of sea trials, Meyer said in his presentation. The carrier’s Multi-Function Radar has done high-power radiation from all three of its faces and handed off targets amongst those array faces. The Volume Search Radar just achieved high-power radiation on its third face this week. Though AAG testing is running behind schedule and the data set is limited, Meyer said test data on EMALS has shown the system to be more reliable than predicted.